This article is about the paper-like material. 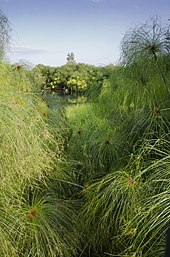 For the plant it is made from, see Cyperus papyrus. For other uses, see Papyrus (disambiguation). Papyrus was first manufactured in Egypt as far back as the fourth millennium BCE. The earliest archaeological evidence of papyrus was excavated in 2012 and 2013 at Wadi al-Jarf, an ancient Egyptian harbor located on the Red Sea coast. These documents date from c. 2560–2550 BCE (end of the reign of Khufu). 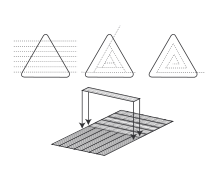 The papyrus rolls describe the last years of building the Great Pyramid of Giza. In the first centuries BCE and CE, papyrus scrolls gained a rival as a writing surface in the form of parchment, which was prepared from animal skins. Sheets of parchment were folded to form quires from which book-form codices were fashioned. Early Christian writers soon adopted the codex form, and in the Græco-Roman world, it became common to cut sheets from papyrus rolls to form codices. 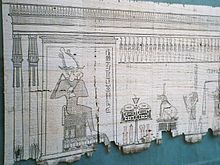 Papyrus was replaced in Europe by the cheaper, locally produced products parchment and vellum, of significantly higher durability in moist climates, though Henri Pirenne's connection of its disappearance with the Muslim conquest of Egypt is contested. Its last appearance in the Merovingian chancery is with a document of 692, though it was known in Gaul until the middle of the following century. The latest certain dates for the use of papyrus are 1057 for a papal decree (typically conservative, all papal bulls were on papyrus until 1022), under Pope Victor II, and 1087 for an Arabic document. Its use in Egypt continued until it was replaced by more inexpensive paper introduced by the Islamic world who originally learned of it from the Chinese. By the 12th century, parchment and paper were in use in the Byzantine Empire, but papyrus was still an option. The word for the material papyrus is also used to designate documents written on sheets of it, often rolled up into scrolls. The plural for such documents is papyri. Historical papyri are given identifying names — generally the name of the discoverer, first owner or institution where they are kept—and numbered, such as "Papyrus Harris I". Often an abbreviated form is used, such as "pHarris I". These documents provide important information on ancient writings; they give us the only extant copy of Menander, the Egyptian Book of the Dead, Egyptian treatises on medicine (the Ebers Papyrus) and on surgery (the Edwin Smith papyrus), Egyptian mathematical treatises (the Rhind papyrus), and Egyptian folk tales (the Westcar papyrus). When, in the 18th century, a library of ancient papyri was found in Herculaneum, ripples of expectation spread among the learned men of the time. However, since these papyri were badly charred, their unscrolling and deciphering is still going on today. The Heroninos Archive is a collection of around a thousand papyrus documents, dealing with the management of a large Roman estate, dating to the third century CE, found at the very end of the 19th century at Kasr El Harit, the site of ancient Theadelphia [de], in the Faiyum area of Egypt by Bernard Pyne Grenfell and Arthur Surridge Hunt. It is spread over many collections throughout the world. ^ "Papyrus definition". Dictionary.com. Retrieved 20 November 2008. 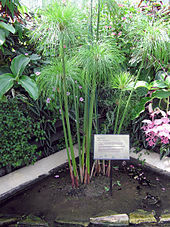 ^ "Ebers Papyrus". Encyclopædia Britannica. Retrieved 8 March 2014. ^ a b Tallet, Pierre (2012). "Ayn Sukhna and Wadi el-Jarf: Two newly discovered pharaonic harbours on the Suez Gulf" (PDF). British Museum Studies in Ancient Egypt and Sudan. 18: 147–68. ISSN 2049-5021. Retrieved 21 April 2013. ^ Černý, Jaroslav. 1952. Paper and Books in Ancient Egypt: An Inaugural Lecture Delivered at University College London, 29 May 1947. London: H. K. Lewis. (Reprinted Chicago: Ares Publishers Inc., 1977). ^ Pirenne, Mohammed and Charlemagne, critiqued by R.S. Lopez, "Mohammed and Charlemagne: a revision", Speculum (1943:14–38.). ^ David Diringer, The Book before Printing: Ancient, Medieval and Oriental, Dover Publications, New York 1982, p. 166. ^ Bompaire, Jacques and Jean Irigoin. La paleographie grecque et byzantine, Centre National de la Recherche Scientifique, 1977, 389 n. 6, cited in Alice-Mary Talbot (ed.). Holy women of Byzantium, Dumbarton Oaks, 1996, p. 227. ISBN 0-88402-248-X. ^ Lewis, N (1983). "Papyrus and Ancient Writing: The First Hundred Years of Papyrology". Archaeology. 36 (4): 31–37. ^ a b Hans Dieter Betz (1992). "The Greek Magical Papyri in Translation, Including the Demotic Spells, Volume 1". ^ Frederic G. Kenyon, Palaeography of Greek papyri (Oxford, Clarendon Press, 1899), p. 1. ^ Frederic G. Kenyon, Palaeography of Greek papyri (Oxford, Clarendon Press, 1899), p. 3. ^ Diringer, David (1982). The Book Before Printing: Ancient, Medieval and Oriental. New York: Dover Publications. pp. 250–256. ISBN 0-486-24243-9. ^ Bierbrier, Morris Leonard, ed. 1986. Papyrus: Structure and Usage. British Museum Occasional Papers 60, ser. ed. Anne Marriott. London: British Museum Press. ^ Lyons, Martyn (2011). Books: A Living History. Los Angeles, California: Getty Publications. p. 21. ISBN 978-1-60606-083-4. ^ Murray, Stuart (2009). The Library: An Illustrated History. New York, NY: Skyhorse. pp. 10–12. ISBN 9781602397064. ^ Cerny, Jaroslav (1947). Paper and books in Ancient Egypt. London: H. K. Lewis & Co. Ltd.
^ Lucas, A. (1934). Ancient Egyptian Materials and Industries, 2nd Ed. London: Edward Arnold and Co.
^ (Maclean et al. 2003b; c). ^ Langdon, S. 2000. Papyrus and its Uses in Modern Day Russia, Vol. 1, pp. 56–59. ^ Maclean, I.M.D., R. Tinch, M. Hassall and R.R. Boar. 2003c. "Towards optimal use of tropical wetlands: an economic evaluation of goods derived from papyrus swamps in southwest Uganda." Environmental Change and Management Working Paper No. 2003-10, Centre for Social and Economic Research into the Global Environment, University of East Anglia, Norwich. ^ "Ancient Egyptian Medical Papyri". Retrieved 17 June 2014. ^ Diringer, David (1982). The Book Before Printing: Ancient, Medieval and Oriental. New York: Dover Publications. p. 252 ff. ISBN 0-486-24243-9. ^ Černý, Jaroslav. "The Will of Naunakhte and the Related Documents." The Journal of Egyptian Archaeology 31 (1945): 29–53. doi:10.1177/030751334503100104. JSTOR 3855381. Thompson, Edward Maunde (1911). "Papyrus" . Encyclopædia Britannica. 20 (11th ed.). pp. 743–745. "Papyri.info Resource and Partner Organizations". papyri.info. Archived from the original on 20 September 2018.